How to navigate 200 Brighton venues full of artists in one afternoon, well perhaps that might be a big ambitious. So instead join in the fun of discovering open houses in Brighton in May with my top tips. I give you my artist insider tips, a map and the online brochure for the entire open house experience. All to help you make it a fun day out and memorable experience. How do you get invited to the artist private view for wine and nibbles? Plus navigating your way around the 14 artist trails, making it fun and easy to discover new areas of Brighton as well as meeting the very eclectic, colourful, artistic community. Last year it was totalled that about 1,500 artists exhibited in 200 venues across the city of Brighton and beyond. Anyone living in the 01273 telephone area can take part in the Artists Open Houses (AOH) festival as an Open House venue. So a big area! You may never have heard of an Open House or even know what one is. Artists set up their house a little like a gallery and open their doors every weekend in May, to coincide with the Brighton Festival (the 2nd largest in the country after Edinburgh). Quick history; artist Ned Hoskins (Fiveways Group) 25 years or more back decided that he wanted to show his artwork along with a few artist friends so he set up his house and invited people along. Since then it has blossomed with a huge artist community opening their doors providing 14 trails to investigate. 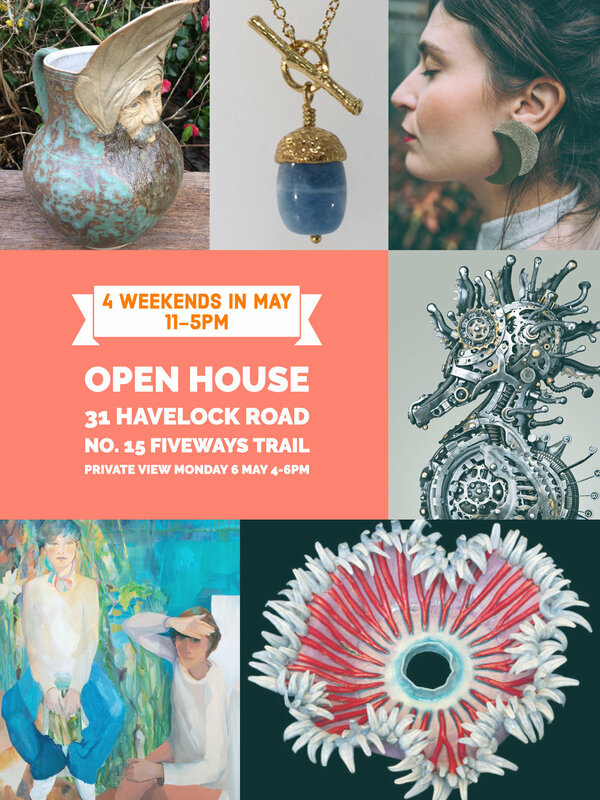 I am exhibiting in the ‘Fiveways Trail’ with my good Friend and ceramicist Frances Doherty www.francesdoherty.co.uk Frances creates amazing colourful ceramics, see below. You will see that there are areas of the city split into groups i.e Fiveways Trail which happens to be the trail I am in. Maybe there is one that does afternoon teas and cakes in one of the houses/gardens. Use the Open House guide and browse through your chosen houses to see which art you would like to see and head for them. My top tip: get invited to the Private Views! As well as being great fun you also get a glass of wine. PV’s take place early evening, often in the week. Houses celebrate their opening with a private view and a glass of wine and nibbles and music makes it a fun way to look at art. Check out the Open House guide and email them for an invite, artists are welcoming and want to meet you. A few practical points; be aware that parking can be restricted in Brighton, limited disabled access in some venues as they are residential houses, artists mostly have payment facilities on hand but paying with cash for smaller items is often welcomed. Of course the art is for sale and it is all clearly laid out, a bit like a mini gallery but much less informal. It is set up to be a welcoming experience and is a great way to look at art. You can expect the artist to be on hand to chat about their work too. Unusual occurrences at the Open House? One man wandered in and was in the house for ages, then he started opening drawers and cupboards but not saying anything, it was so funny and striking we did tell him not to after a while.